Thanks for participating in the Hunter Games! It's our latest virtual camp, and it's brought to you by Georgia State Head Coach, Ron Hunter and his son, Boston Celtics Shooting Guard, RJ Hunter. Complete 7 workouts over 15 days. Top the leaderboard and win prizes based on your performance. Be the top dog and take on RJ Hunter in the ultimate Hunter Game - a 1 on 1 virtual challenge via your ShotTracker device. Follow us on social media for tips and shoutouts along the way. Invite your parent, friend or mentor to attend our live Father's Day Weekend hangout with Ron and RJ. They'll give us the inside scoop on D1 basketball, being a rookie in the NBA, and the best way for coaches to encourage their athletes. Purchase a ShotTracker. Use coupon code OFFSEASON and get yours for $99. Sign up for THE HUNTER GAMES in the ShotTracker app under CAMPS. A new workout will be released every other day. Complete the workout, check your ranking on the leaderboard and keep an eye on social for shoutouts from RJ (Instagram) & Coach Hunter (Twitter). Be ready for the awards ceremony on Sunday, June 26TH at 8:00PM EST where we'll announce the winners in each category. True champions will compete for bragging rights, but prizes make it a little more fun. Good luck! Complete all 7 workouts with the best field goal percentage and compete in the Ultimate Hunter Game - a 1 on 1 virtual challenge against RJ Hunter via your ShotTracker device. 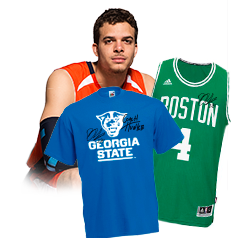 You'll also get a signed Celtics jersey and a signed GSU t-shirt. Complete all 7 workouts with your ShotTracker device and get a free Hunter Games t-shirt. The top 3 players with the MOST shots taken over the course of the camp will each win a signed Spalding basketball. This means putting up more shots outside the assigned workouts. Best social media picture with #HUNTERGAMES gets a signed ShotTracker swag bag with two t-shirts and a shooting sleeve. First 3 people to finish all 7 workouts win GSU t-shirts signed by both Coach Hunter and RJ. Free ShotTracker for the person who completes the challenge "manually" (without a device) and posts the best reason as to why they should win! Use #HunterGames. Rules: Workouts must be completed within the deadline established. Program and prizes are at the sole discretion of ShotTracker and can be modified at any time. The purpose of these challenges is to make better players. Suspicious or fraudulent results will be disqualified by ShotTracker. All ties will be broken by time on court (in this case, longer is better).